Hi @gregthebuzz – You might have better luck moving some of your logic into BP_Group_Extension, which does most of the template-related work for you. 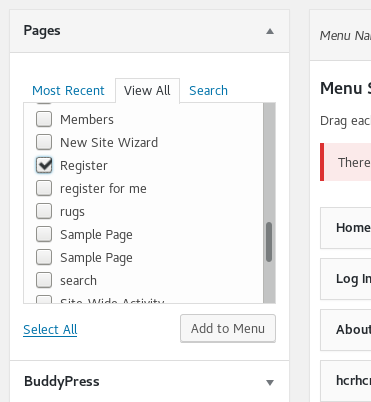 See https://codex.buddypress.org/developer/group-extension-api/. The display() method is where the content for your public-facing tab will go, while the edit parameter will help you configure what you’d like group admins to see under Manage. I’m unsure how or whether this’ll integrate neatly with https://wordpress.org/plugins/bp-extend-groups-fields/. That’s something you’ll probably want to talk to that plugin author about. I suggest logging in as a non-admin, then right-clicking the space where the avatar should appear. Select ‘Inspect Element’, and then browse through the developer tools to see whether the avatar is actually in the source. If it is, but is hidden by CSS, you should be able to use the inspector to figure out which CSS is the culprit. If it’s not there at all, you could have some other sort of problem – like, perhaps, a failure to connect to Gravatar. Hi @datenfresser – You can customize the template by overriding the template file in your child theme. Copy the file wp-content/plugins/buddypress/bp-templates/bp-legacy/buddypress/members/single/messages/messages-loop.php to wp-content/themes/[your-theme]/buddypress/members/single/messages/messages-loop.php, and make your modifications to the new file. Something like that should get you close to what you want. To link the excerpt, find the line that includes bp_message_thread_excerpt(), and wrap it in a link to bp_message_thread_view_link(). See the ‘View Message’ markup just above for a template you can copy. 2. Do you have the same problem with other content? Can you post a private message with a special character in the subject line? A blog post with a special character in the title? These items will help narrow down whether it’s a problem with bp-groups, or a database-level config issue. There are a number of ways you could accomplish it. If you had the technical know-how, you could build a tool that hooks into XProfile and syncs user-entered data to another system (maybe an array in usermeta or something like that). Another option is to manually created new fields every 3 months, but then you’d need to do some customization to the way fields are displayed on the front end so that the profile doesn’t show all past entries as separate items. Either way, some customization would be required. Maybe someone on this forum knows of an existing tool that will help. 4. Are timestamps for WP content (like posts and comments) correctly displayed? 5. When you look in the database – wp_bp_activity, the date_recorded column – what do the timestamps look like? Are they UTC or in your local timezone? It’s generally recommend to keep PHP in UTC and to allow WP/BP to do the timezone offsets; see https://weston.ruter.net/2013/04/02/do-not-change-the-default-timezone-from-utc-in-wordpress/ for one account. My guess is that your server time is set to local time, so that things are getting double-adjusted. How this can best be fixed depends on whether only activity items are affected, or if it’s all items on the installation. Unlikely – mods to the .htaccess file might prevent the call from going through in the first place. This AJAX call is successfully hitting the server, but it’s returning something incorrect. Given that the item is showing up in the database/Dashboard, it’s highly likely that your theme is the culprit. As a test, try switching to the Twenty Fourteen theme to see if that makes the problem go away. If you have the ability to search your codebase, either via SSH or as a local copy, you should search it to find the string from the screenshot. That’s how I’d start debugging. To add additional fields to the registration process, go to Dashboard > Users > Profile Fields. Add one for Address and one for Phone Number. Make them required and/or private, if you’d like. As long as they are part of the ‘Base’ profile field group, they will appear as part of the registration process.